California’s wine country is pretty family friendly. 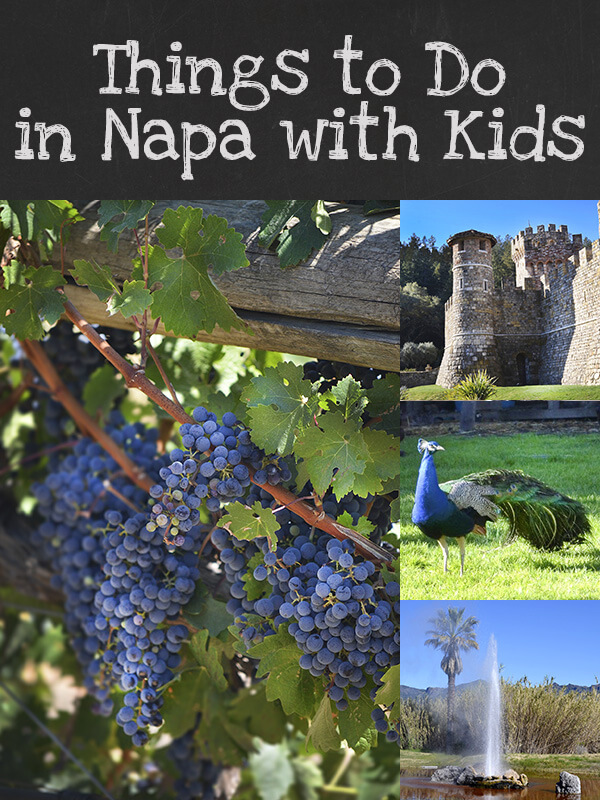 Here’s a great list of things to do in Napa with kids, from wine to castles to stone forests! This past year I have spent a lot of time in Northern California, visiting olive groves and stores for my olive oil cookbook. I love, love, LOVE visiting this part of the state. You have gorgeous landscape and it’s a foodie heaven. Napa and Sonoma Valley is a real treat, too. And I’m not just talking about the wine. Napa Valley is actually very family friendly. I would know, as I have schlepped my kids everywhere with me. Everywhere. And if you find yourself with your kidlets in Napa Valley – don’t worry! I have plenty of things to do in Napa with kids. And that includes some wine, too, if you like. Yes, you read that right. The jellybean factory is not in the heart of Napa Valley, but approximately 30 minutes southeast of downtown Napa. It’s open all year round except for 4 days out of the year, New Year’s Day, Easter Sunday, Thanksgiving Day, and Christmas Day. The 40-minute guided factory tours are free and you don’t need reservations. But, you will have a longer wait time during the holidays and peak vacation days. There’s a store (of course) and a café. Even if you don’t like jelly beans, you will really enjoy learning how these sweet beauties are made. You can learn more here. In a gorgeous park you will find a water-powered grist mill that was built in 1846. Locals would have their corn and wheat ground into meal or flour in this mill. Demonstrations of this gorgeous 36-foot water wheel and historic tours are only offered on weekends. Surrounding the mill, are picnic facilities and a number of trails. The round trip hike from Bale Grist Mill State Historic Park to Bothe-Napa Valley State Park is approximately two miles. Although my family and I couldn’t visit the mill as we were visiting on a Monday, you can see the mill right off Highway 29. Since you are in the heart of wine country you must visit a winery, right? If you haven’t been to Napa, let me tell you there are some very nice, fancy vineyards to visit. But you are with your family, kids in tow. You can’t take hyper kids to some these places. Save those wineries when you return WITHOUT the kids. But that doesn’t mean you have to scratch wine tasting off your list of things to do. 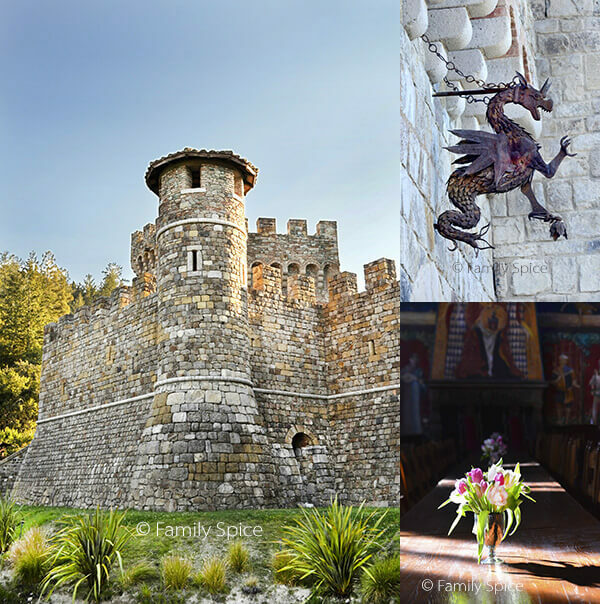 Just 15 minutes north of downtown Napa, in Calistoga, you will find Castello di Amorosa just off the highway. Yes, it’s a castle. For a $20 ticket, you can wander and explore inside the castle, finishing off in the basement tasting room. Mom and Dad get to taste 5 wines. The kiddos get in for $10 each and get to cap the day with some grape juice. If this is too pricey for you, the grounds surrounding the Castle are open to the public – and FREE of charge. You’ll find peacocks, chickens, sheep, goats, even an emu walking about. And did I mention the dragons? You’ll find them all over the castle, too. Other fun wineries to explore with the family: Sterling Vineyards offers a gondola ride during your vineyard tour. Long Meadow Ranch tours include riding in a 4×4 vehicle. Hunnicutt Wines has a 15,000 square foot cave room to explore. Landmark Vineyards doesn’t use 4×4’s for their tours, but horse-drawn carriages. Also in Calistoga, a few minutes just north of the Castle, you can enjoy California’s Old Faithful Geyser. It is one of three “faithful” geysers in the world because of its regular eruptions. When we visited in February, the geyser was erupting every 5-7 minutes. The length of time between eruptions is dependent on the time of year and weather. Colder months tend to make the wait time a little longer between geyser eruptions. It may not be as big and majestic as Old Faithful in Yellowstone, but it is pretty cool to see in person. There are plenty of places to sit and relax on hand. Pack a picnic lunch, lay on the grass and play bocce ball. 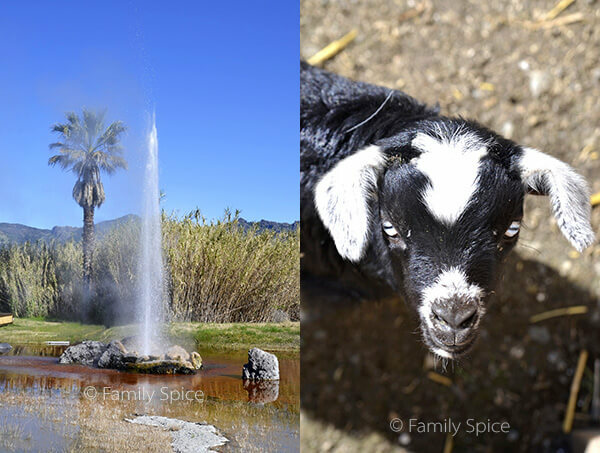 With your ticket, you can also visit the many goats that are on the property: Tennessee Fainting Goats, Jacob’s Four-Horn Sheep and Guard Llamas. 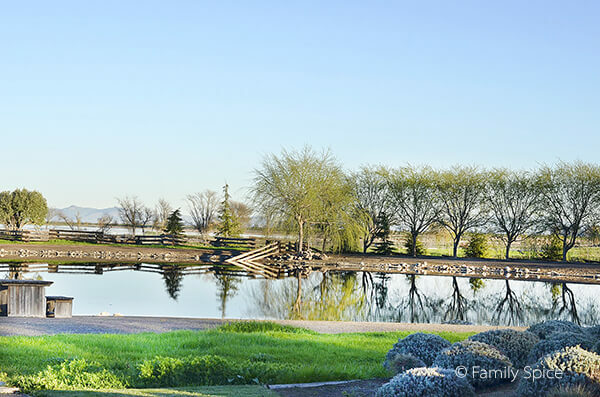 If enjoying the great outdoors and geology is your thing, then you have to check out the Petrified Forest. My parents were both geologists (ok, Mom, you were a micro-paleontologist) and fossils, rocks and oil was a HUGE part of my childhood. My kids have learned to love geology, too. 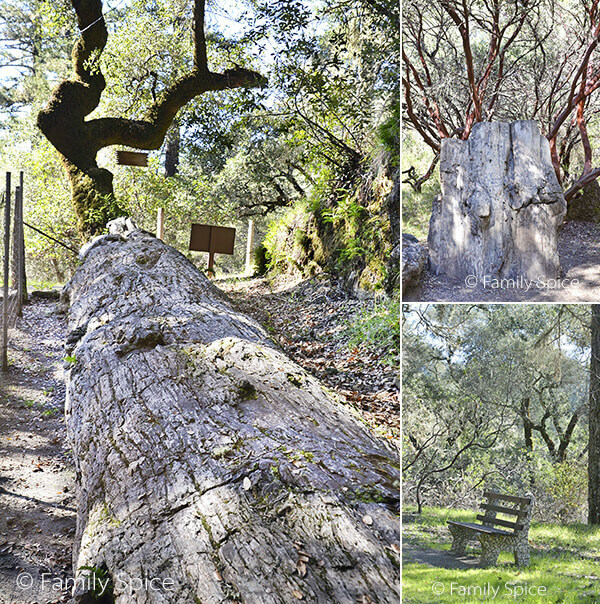 About 20 minutes east of Calistoga, where your cell phone drops in and out of coverage, is a gem of a park. You can take a guided tour or walk about on your own. The 1/2-mile loop is not a strenuous hike, just enough to get your blood pumping and to help kids expend some nervous energy! Everywhere you turn, you will find amazing pieces of petrified redwood. This area was covered with giant redwood trees until a local volcano (now dormant) turned them to stone 3.4 million years ago. On your hike, you will also find a 100 foot-high ash fall. It’s truly an amazing site. Don’t forget to pick up a geological momento in the gift shop, too. Another blast from my childhood is the Peanuts Gang. My love for Snoopy, Charlie Brown and the gang was definitely passed down to my children. When I was a kid, every Sunday I poured over the Sunday Comics. I continued this tradition when I was single and working. I was pregnant with my first born when Charles Schulz passed away. Somewhere in my closet, is his Sunday strip. 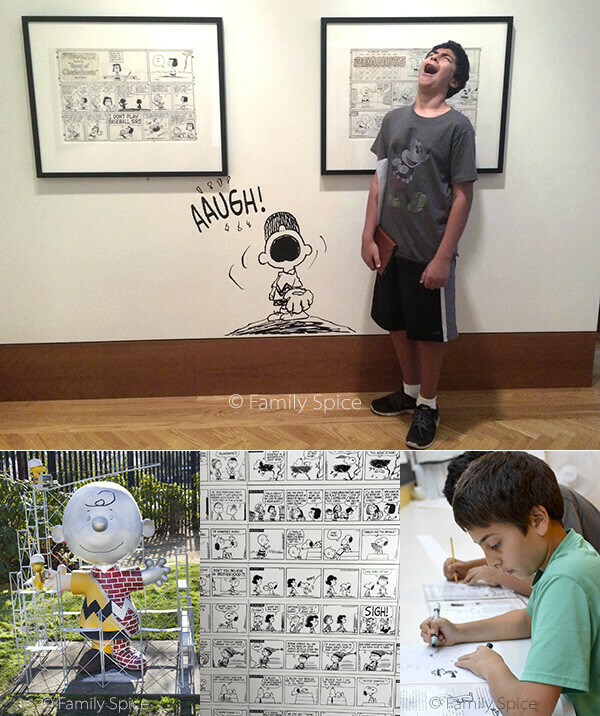 So when I heard about the Charles M. Schulz Museum in Santa Rosa (about 30 minutes north of Sonoma), we HAD to go visit. In the museum you will learn all about Sparky, how he grew up, how Snoopy came about and the millions of lives he touched. There is plenty of art, comics and creative energy flowing in this building. Upstairs the kids can learn to draw the whole gang and next to the museum is the ice rink and the Warm Puppy Café that Sparky loved so much. When my kids were toddlers, my husband and I hunted down playgrounds to break up the sightseeing. The Historic Sonoma Plaza is not only uber cute, filled with shops, restaurants, galleries and yes, wine bars, but, it is also a traditional downtown square, with a massive park in the center. You can throw the ball, have a picnic or watch the monkeys play on the playground. How can I not talk about olive oil when I am writing about Napa-Sonoma County? 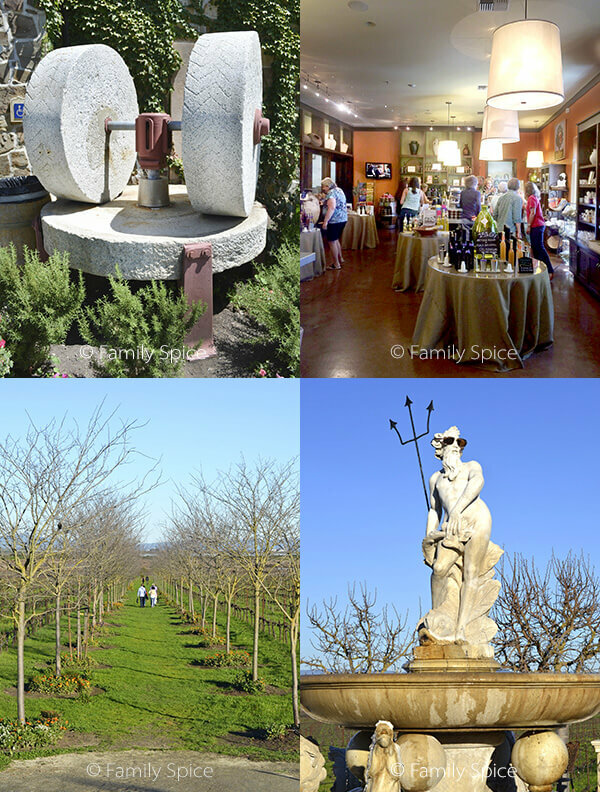 There are many places in wine country to sample premium extra virgin olive oil, but again, not all of these places are family friendly. About 10 minutes south of downtown Sonoma is The Olive Press, the very first olive mill in Sonoma, California. The grounds surrounding the Olive Press is stunning, with plenty of leg room for running feet. Inside the stone building you have two tasting rooms. On one side, it’s all about olive oil. You can see the machines used for olive pressings, sample as many olive oils and vinegars as you want and learn everything you need to know about my favorite fat. In the other tasting room, you will find, well, wine. The Cline family not only produce wonderful extra virgin olive oil, but they also make fabulous wine. When Mary/California Greek Girl and I attended a book signing at the Olive Press in February, my husband discovered a real gem. You can take casting lessons Leland Flyfishing Outfitters. Open Friday and Saturdays, you can shop for fly fishing gear, or take lessons on this serene property. The owners were super nice and answered all of my husband’s many fishing questions! If fly fishing isn’t your thing, why not be adventurous and take a 20 minute flight in a vintage biplane? Okay, my family and I did not do this, but it was totally cool watching these beauties buzz by The Olive Press (they are located right next door). Hubby definitely wants to go back and schedule a ride. Me? I’ve got issues. Yes, kids can fly, too, as long as they meet the height requirements. Appointments aren’t necessary, but they are closed Tuesdays and Wednesdays. So you can see, there is plenty to see and experience in Napa and Sonoma Valley that has nothing to do with wine and will sure to be fun for big kids and little kids alike. And there is plenty more that is NOT listed, like Segway tours, bike rides, hot air balloon rides and more. If I missed something, please share in the comments. Napa and Sonoma Valley is filled with farmers and ranchers, hills and rocks and plenty of open country for kids to run and have fun. It’s not all about wine, but if you indulge in some vino, please be sure to drink responsibly. You have precious cargo on board. Crush Season is around August-September. So if you want to see grapes on the vine, visit May-August. And during the crush, this area gets very busy and is considered peak season. Disclosure: I was not paid to write this post nor was I compensated in any other way. My family paid for all the tours we took ourselves. 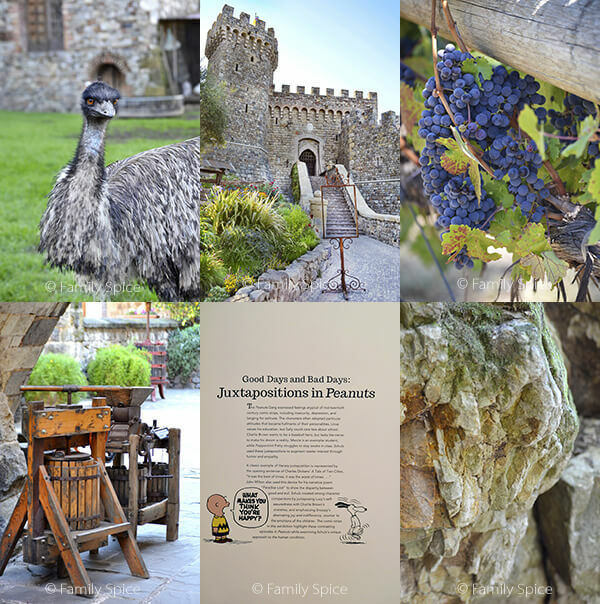 But my olive oil cookbook is sold in The Olive Press and in Castello di Amorosa, so if you go there, check it out!